Last summer-fall, the Illinois Veteran’s Home – Quincy suffered a Legionnaires’ disease outbreak that sickened dozens and killed a number of people. 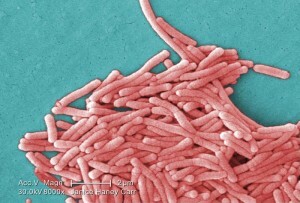 On Friday, The Illinois Department of Public Health (IDPH) announced a confirmed case of Legionnaires’ disease in an Adams County resident. IDPH identified at least two locations where the individual could have been exposed to the bacteria, one being the personal residence, the other being the Quincy Veterans’ Home. Test results are unable to provide a conclusive link to either location. “While this case is not confirmed to have come from the Quincy Veterans’ Home, we are continuing to implement every necessary precaution to ensure the health and safety of our residents and staff. That is our top priority,” IDVA Director Erica Jeffries said. In September 2015, the IDVA began implementing measures to control Legionella bacteria that may have been in the plumbing systems. A number of steps have been undertaken to remediate the water. Measures include construction of a new water treatment facility that provides thermal and chemical treatment to control bacteria.